The advanced trainer jet flew about 6 hours without stops for the first time. Italian M-346 completes longest nonstop flight ever. The Italian Air Force has set a new record for the T-346A (M-346) advanced trainer jet flying the longest nonstop route ever for the type. The milestone was reached during the recent Middle East tour organized by the Italian Air Force together with Leonardo SpA to demonstrate Italian high technology in Qatar, Bahrain and Kuwait through the excellent acrobatic skills of the Italian military pilots. On November 9, the T-346A aircraft took off from Pratica di Mare AB, Rome, together with 2 Eurofighter jets and a KC-767 tanker aircraft to reach Al Udeid AB, Qatar, after covering a route of about 4,000 km in 6 hours. This goal was made possible thanks to the ability of the Italian-built trainer jet to refuel in flight. The M-346 is the only advanced fly-by-wire trainer, new generation and light fighter in the world able to perform this operation. 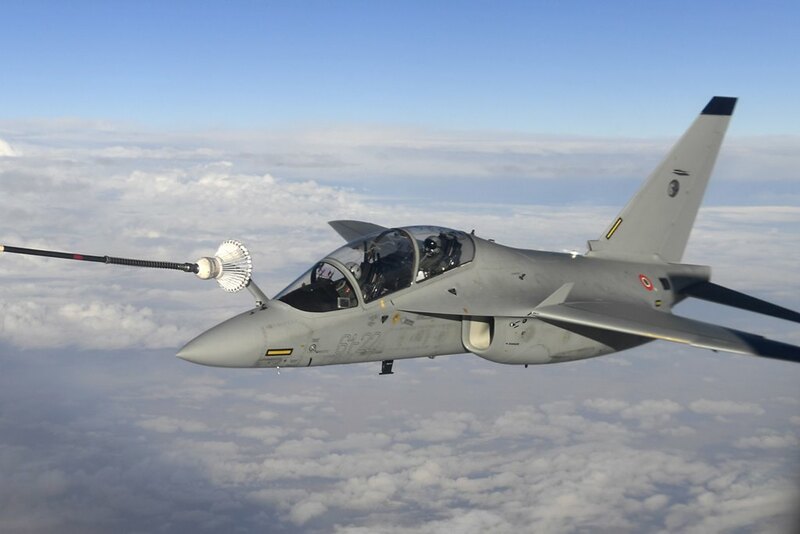 Thanks to the air-to-air refueling systems, fully integrated in the aircraft and certified, all the M-346 variants are capable to be easily redeployed to a faraway Forward Operating Air Base, employed for tactical operations or to train pilots in AAR operations. The quickly deployment in the Middle East was an example of such skill. During the tour, pilots belonging to the Reparto Sperimentale Volo of the Italian Air Force performed the demo displays of Eurofighter and T-346A in Qatar, Barhain and Kuwait. They showed how the T-346A, as well as the Eurofighter, is able to remain fully controllable at a high angle of attack and perform rapid acceleration and climbing. In addition, the Frecce Tricolori have demonstrated the ability of Italian pilots to fly in formation. The tour marked an excellent opportunity to show the Gulf nations how Italy can offer excellent technology or great training for military pilots. Kuwait already sends its students to the international flight school of the Italian Air Force. On November 20, 7 Kuwaiti students received the military pilot's patents in Italy.